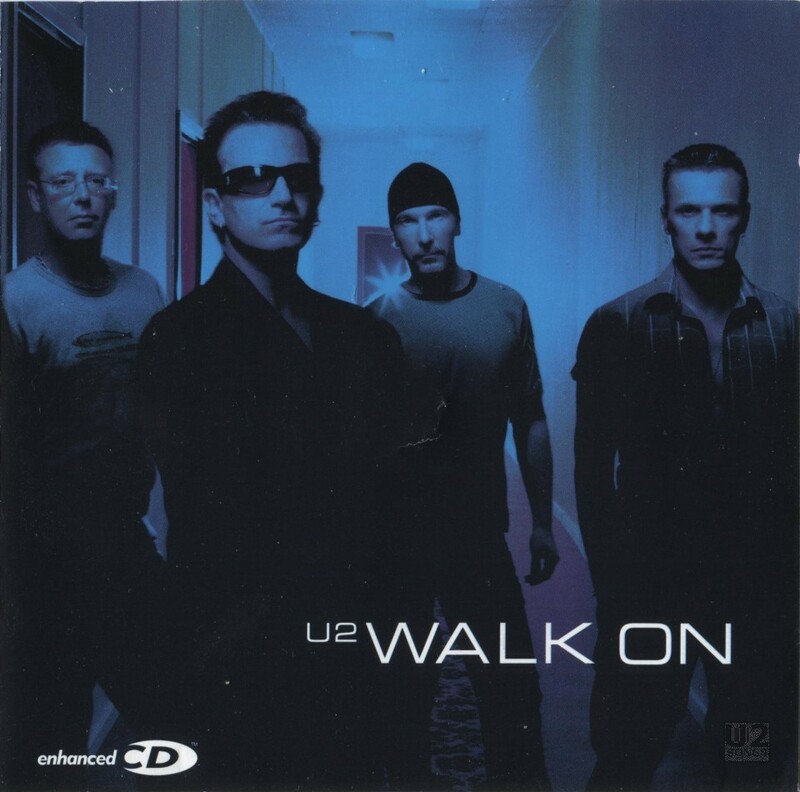 In North America, “Walk On” was the second single released from All That You Can’t Leave Behind. Throughout the rest of the world, “Stuck in a Moment You Can’t Get Out Of” was the second single. “Walk On” would eventually be released to the rest of the world as the last single from All That You Can’t Leave Behind, in late 2001. The song itself was inspired by Aung San Suu Kyi, a longtime human rights campaigner who was wrongfully imprisoned by the Burmese government in an effort to prevent her from assuming leadership of that country. U2 became aware of Suu Kyi after she received the Freedom of Dublin Award in 2000, the same year the honour was bestowed upon the band. A commercial CD was released in the UK, Europe and Australia. It would feature the same artwork as the earlier “Walk On” release in Canada, however these covers were tinted a variety of colours. A DVD single was also issued which contained promotional videos for the “Elevation 2001: Live from Boston” video release. Two videos were filmed for “Walk On.” The first was directed by Liz Friedlander and released in February 2001 to promote the song in the USA and Canada. The video was shot in London in November of 2000. It featured footage of U2 performing in-studio and walking through the streets of London. This is intercut with shots of people running through the streets, being bullied, and then later escaping their situations and tearing at their clothing. It ends with an infinite view of people making up the inside of an eye as the camera pans out. The second video, directed by Jonas Akerlund, was released in the fall of 2001 to promote the worldwide single release. It features footage shot in Rio de Janeiro, Brazil in November 2000, during the promotional tour for All That You Can’t Leave Behind. Footage includes U2 interacting with fans, walking through Rio, playing soccer on the beach, and standing on the balcony of the Copacabana Hotel. It is interspersed with footage from their performance at Globo Studios. Both versions of the video were included on the U218 Singles compilation. “Walk On” was first performed live at Irving Plaza in New York on December 5, 2000, during the All That You Can’t Leave Behind promotional tour. It was performed every night on the 2001 Elevation Tour, with the exception of one concert in Manchester, UK. The song was rarely played during The Vertigo Tour, appearing in-full at just eleven shows. It made a permanent return to the setlist for The U2360 Tour, however, being played at every show between 2009 and 2011. Live recordings of the song have appeared on the Go Home: Live from Slane Castle, Ireland DVD and fan club CD (Dublin, September 1, 2001), the Elevation 2001: Live from Boston DVD (Boston, MA, June 2001), and the multi-artist America: A Tribute to Heroes album and DVD (London, UK, September 21, 2001). This version, which is preceded by an excerpt of U2’s “Peace on Earth,” was recorded in a studio in London and features David Stewart, Natalie Imbruglia and Morleigh Steinberg on backing vocals. Finally, a version recorded in Zagreb, Croatia on August 9, 2009 (and preceded by “MLK”) during the U2360° tour was included on the fan club album U22. The 22 tracks on this live compilation, out of an eligible 46 recordings, were selected by popular vote by members of the U2 fan club. Several different versions of “Walk On” have been released in addition to the versions contained on this single. A “Remix” version with slightly different instrumental levels was released on promotional CD. As mentioned previously, an alternate edit was contained on the earlier Canadian releases. Another promotional CD was released in February, 2002 to coincide with that year’s Grammy Awards ceremony. It included a unique mix by Mike Hedges called the “Hallelujah Mix.” The B-sides “Big Girls are Best” and “Beautiful Day (Quincey & Sonance Remix)” were later included on the Target-exclusive “7 (Rare and Remixed)” EP. Music by U2. Lyrics by Bono. Produced by Daniel Lanois and Brian Eno. Engineered by Richard Rainey. Assisted by Chris Heaney. Additional production by Steve Lillywhite. Additional engineering by Stephen Harris and John Seymour. Assisted by Alvin Sweeney. Recorded live in Boston June 6, 2001. Music and lyrics by U2. Recorded by John Harris and Max Feldman. Mixed by John Harris and Steve Lillywhite. Recorded live in Boston June 6, 2001. Music by U2. Lyrics by Bono and the Edge. Recorded by John Harris and Max Feldman. Mixed by John Harris and Steve Lillywhite. Recorded May 25th, 2001, Air Canada Centre, Toronto Ontario. Music by U2. Lyrics by Bono. Recorded by Joe O’Herlihy. Remix and additional production by Paul Van Dyk. Music by U2. Lyrics by Bono. Original version produced by Daniel Lanois and Brian Eno. Directed by Joseph Kahn. Music by U2. Lyrics by Bono and the Edge. Produced by Daniel Lanois and Brian Eno. Engineered by Richard Rainey. Assited by Chris Heaney. Mixed by Tim Palmer. Synthesizers by Brian Eno and Bono. Additional guitar by Daniel Lanois. Brass by Paul Barrett. Directed by Jonas Akerlund. Music by U2. Lyrics by Bono. Produced by Daniel Lanois and Brian Eno. Engineered by Richard Rainey. Assisted by Chris Heaney. Additional production by Steve Lillywhite. Additional engineering by Stephen Harris and John Seymour. Assisted by Alvin Sweeney. New Zealand, RIANZ Top 50: Did Not Chart.